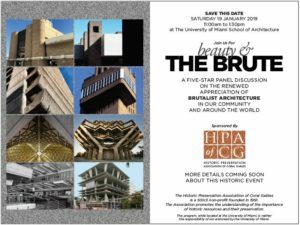 Join the Historic Preservation Association of Coral Gables on January 19, 2019 at the University of Miami School of Architecture Glasgow Lecture Hall for its annual educational event titled Beauty & The Brute. The five-star panel will discuss the emerging interest in the Brutalist movement, its buildings, and the need to preserve such structures. The panel will tackle global, national and local initiatives [including the future status of the 1973 Brutalist-home of the Coral Gables public safety building]. The discussion is timely and will put HPACG at the forefront of this important preservation issue. The event is free. Refreshments and light bites will be available to guests. The physicality of Brutalism seems to be resonating once again, not least in the form of a determined effort by the Historic Preservation Association of Coral Gables to draw public attention to the plight of the Public Safety Building, which– as part of a land-swap arrangement between Coral Gables and a local developer — is likely to be scheduled for demolition by 2020. 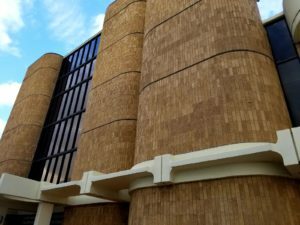 The goal is to prevent the eradication of our architectural patrimony and encourage at least the partial preservation of our own, singular Brutalist landmark. Just look at Marcel Breuer’s Whitney Museum – a classic Brutalist structure that’s now part of The Metropolitan Museum of Art in New York — and realize how re-purposing ‘out of style’ buildings can still make cultural and economic sense.